The specialty biocides described in this report include many different chemical types that are used in a variety of end-use areas. They are linked only by their common functionality in destroying or inhibiting the growth of a broad range of microorganisms. The specialty biocides—active ingredients, not formulated products—have been subdivided into eight product categories—active halogen compounds, inorganics, organic acids and salts, quaternary ammonium compounds, phenolics, organosulfur compounds, organometallics, and other biocides. Excluded are chemicals that are highly lethal to all living things (e.g., hydrogen cyanide), pharmaceuticals, chemicals used solely to control agricultural pests (i.e., pesticides), and commodity biocides (e.g., sodium hypochlorite and alcohols). An important consideration in the biocides market is the impact of government regulations. In the United States, Western Europe, Japan, and China, as well as elsewhere in the world, these regulations require the registration of biocides, a process that includes lengthy and expensive toxicological tests that are designed to demonstrate whether the products can be used safely. Compliance with these regulations requires expertise and infrastructure, and this was a major reason why many large companies that first entered this business were often large manufacturers of pharmaceuticals or pesticides that already had similar biological testing capabilities and registration groups. Over time, newer regulations in most world areas have further restricted or banned the use of some biocides and stimulated the use of acceptable replacements of lower human toxicity. Because of the increasing cost of complying with these regulations, very few new products have been introduced in the past five years. Since the Biocidal Products Directive entered into force in mid-2000 in the European Union, about threequarters of approximately 1,200 biocidal actives have disappeared from the market. Increasing costs have also led to further consolidation within the industry, as the smaller producers were forced to withdraw from the basic production of biocides because their lower sales volumes could not justify these added costs. This process is continuing, and several large companies may emerge with significant participation in a broad range of biocides. Although compliance with government requirements for product safety greatly increases testing and other development costs, profitability is still considered relatively high in many product and market segments. This is because customers have a compelling need to use biocides and no choice but to use registered products. Furthermore, the limited number of producers of each product type and the limitations in substituting one class of biocides for another restrict the choices available to customers. Historically, this has allowed biocide producers to achieve wider sales margins than those achieved with most other specialty chemicals. More recently, these margins have narrowed because of the increasing consolidation among customers, who were able to exert considerable leverage on their suppliers. The fastest growing region is China (accounting for 27% by volume and 22% by value of the world market), which has overtaken Western Europe as the second-largest market worldwide. This growth is being driven by all sectors of the Chinese economy. 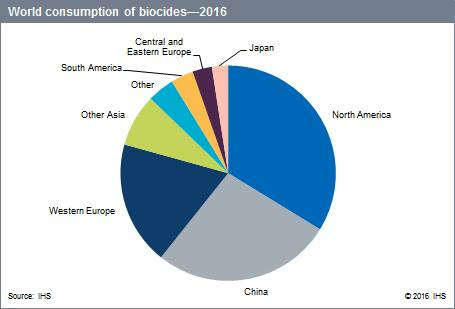 In 2016, North American consumption of specialty biocides accounted for 34% of the global volume and 39% of the global value. Growth in Central and South America is driven by strong demand, stable economic growth, a growing middle class, low per capita consumption, and the need to bring improved products to the market. Brazil is by far the most important market. Western Europe accounts for about 19% of the global volume and 17% of the global market value. Growth expectations for Western Europe are low, as it is a mature market and suffering from a heavy legislative burden, which makes new product development very difficult. The Central and Eastern European biocides market is about 15% of the size of the Western European market. The region is supplied mostly by Western European manufacturers and is expected to grow at an average annual rate of about 2.5% in the next five years. In Japan, the biocides market consists largely of three categories—organics, active halogens, and quaternary ammonium compounds. The market is expected to be mostly stagnant during the forecast years. The 2016 market for specialty biocides at the manufacturer’s sales level worldwide is expected to grow at an average annual rate of about 3.0% (volume basis) during 2016–21.